When Star Wars was first released way back in 1977 it seemed an unlikely space adventure but it soon struck a chord with a million fans around the world. Part of its appeal beyond lightsabers and space ships was the character of the quotable old Jedi Master known as Obi-Wan Kenobi. A New Hope saw the introduction of a seemingly a tired old man, a former General "who fought in The Clone Wars" who needed to get Luke Skywalker from Mos Eisley to Alderaan. ‘Old Ben’ proved to be have been one of the key Jedi in the history of their time – Kenobi had actually unwittingly been caught up in the Sith’s plans to take over the Republic, fought bravely in the Clone Wars and nearly killed Vader (well, he thought he had dealt him a mortal blow and left him for dead). Originally played by Sir Alec Guinness, his acting skills earned him a Best Supporting Oscar nomination. Decades later the younger prequel version by Ewan MacGregor brought new life to the character by showing his Jedi chops and quotes against a couple of Sith Lords and his Clone Army. Guinness and MacGregor both brought different elements of the character to their roles and fans will argue over who did what better but they both delivered some classic lines and quotes. It's my view the Obi-Wan of Episode 3 was the best realization of the character but that's only because MacGregor was standing on the shoulders of an acting giant. Here's my favourite quotes – not necessarily the most popular ones. We’ll start with several quotes from A New Hope. "And these blast points, too accurate for sand people. Only imperial storm troopers are so precise"
Mocked by many fans for being very incorrect as the original trilogy showed the Clone troopers were pretty bad shots, this quote is very accurate as the Stormtroopers on the Death Star were ordered to miss. If you'd managed to live through Order 66 like Obi-Wan had, you could forgive him for thinking about stormtrooper precision, and again remember this quote was said before Obi-Wan and the others found themselves running around the Death Star. But how they were the droids! One of the first examples of a Jedi's powers being used in the Star Wars universe has become one of the all time classic Star Wars quotes and a trick repeated by Qui Gon Gin in The Phantom Menace and Luke in Return of the Jedi. It's also up there with Ackbar's "It's a trap" in terms of popularity via internet memes and pop culture references. "Mos Eisley spaceport. You will never find a more wretched hive of scum and villainy." Luke gets his life threatened by a bar patron, sees an arm sliced off, witnessed Han Solo kill Greedo and then is sold out to the Imperial Troopers all in the space of about an hour! How Kenobi felt on board the Millennium Falcon when Alderaan was destroyed by the Death Star. This Force device was used later in The Force Awakens when Leia felt the death of Han Solo. Revenge of the Sith quotes - where you could argue MacGregor’s version of Kenobi shone more brightly than anything else in the other prequels. "Only a Sith Lord deals in absolutes." This is my favourite line from Episode 3 (albeit it drives me crazy when people misunderstand it). It's not as famous as some of Old Ben's others but it's a wise read on Anakin and shows Kenobi has firmly and finally made his mind up about Anakin's state of mind and where his loyalties lie being he has turned to the dark side. Obi-Wan: "It's over, Anakin. I have the high ground." Vader: "You underestimate my power." Which results in Anakin trying it and having his legs cut off as result. Anakin: "The Chancellor doesn't appear to be corrupt." Obi-Wan: "Chancellor Palpatine is a politician." Qui-Gon: "I don't sense anything." How many characters have said that line in a Star Wars movie? It's here because it adds to the long-running gag that runs throughout every Star Wars film. Yoda: "I cannot teach him. The boy has no patience." Obi-Wan: "He will learn patience." Yoda: "Hmm. Much anger in him, like his father." Obi-Wan: "Was I any different when you taught me?" This was an interesting exchange with Yoda and Obi-Wan from Empire Strikes Back. Yoda seemingly was talking to himself and boom, the disembodied voice of a dead Obi-Wan replies. Obi-Wan: "That's no moon. It's a space station"
As the Millennium Falcon arrived where the planet Alderran used to be, it quickly found itself flying towards the Death Star at which point our would-be heroes were put to the test. Darth Vader: Your powers are weak, old man. Obi-Wan: You can't win, Darth. If you strike me down, I shall become more powerful than you could possibly imagine. Obi-wan and his young Padawan learner are having their second life or death duel, the first being where Obi-wan had bested Anakin while he was having one of the greatest tantrums in the history of the galaxy. Obi-Wan left him for dead. First-time viewers of A New Hope never really knew the backstory between these two Jedi - why was Obi-Wan so ready to let Vader kill him? Why did his body disappear? The new prequel movies explained it all and cast more light on the outcome of the duel. This time round the Jedi was 19 years older and his powers were arguably on the wane while Vader was one of the greatest warriors there had ever been. But did Vader beat our brown-robed hero? No, Obi-Wan let Vader’s red saber slice through him and in doing so allowed him to join the Force and thus be able to ultimately guide Luke to destroy the Death Star and then finally defeat Vader which then brought about the death of the Emperor ending a certain reign of terror. Call it the butterfly effect if you will, Kenobi's actions in ANH led directly to Luke and Vader's final confrontation. Recall the scene in the movie when Ben looks at Luke. It was a knowing look that Luke was the key to everything from that point on, not that of a defeated man. Indeed moments after his death, he is channeling a Force warning to Luke tell him 'run Luke, run!'. Even though Han suggested that the Force should be with Luke before they left to take on the giant Death Star, Luke needed this nudge from the dead Jedi to get his groove on so do something important with womp rats back home. "You'll find that many of the truths we cling to depend greatly on our own point of view"
Update: it's now 15 great quotes as Obi-Wan made a surprise appearance in The Force Awakens. “Rey . . . these are your first steps"
Will MacGregor follow up with some lines in The Last Jedi? This article explains how JJ's team was able to conjure up Alec Guiness saying 'Rey!'. So how did they get Obi-Wan Kenobi into The Force Awakens? Was Gandalf the inspiration for Obi-Wan Kenobi? Is Wedge Antilles really Obi-Wan Kenobi's Uncle? Yes, from a certain point of view. Is the best ever cosplay of Obi-Wan Kenobi? This is the last time Anakin and Obi-Wan spoke as friends. As General Kenobi is about to leave to hunt down General Grevious, he shares a nice moment with Anakin which finishes with a very loving, "Goodbye old friend" from Kenobi. This is the last time in the movie the two Jedi converse as friends. A key thing is the lighting - Anakin in the dark and Obi Wan in the light - it is a literal case of foreshadowing what was to come. What are your favourite Obi-Wan Kenobi quotes? Do you prefer them from the prequels? What would you add to this list? 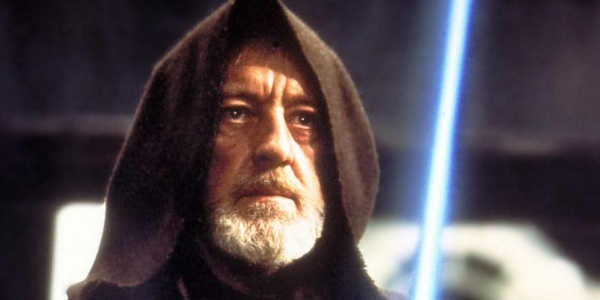 Rumours keep swirling on the net that there is an Obi-Wan Kenobi television series under development. Fingers crossed our favourite bearded one will get a chance at the role. Obi Wan was the best thing about the Prequels IMHO! Just had a marathon last week to remember some scenes and have fun with a friend who never saw the movies and I have to agree. There are a lot of hints, references and subtle foreshadowing lines in the prequels, but Obi Wan was the most interesting part of the movies. He was pretty good! Especially in ROTS ! My favorite Quote is "May the force be with you". Obi-Wan Kenobi says the line to Anakin in Star Wars Episode II: Attack of the Clones. Of course, other characters used it, too. Yep, an almost holy quote! Anakin-Never master your the closest thing i have to a father i love you. Yeah, that was a pretty good quote too! I love this guy, he was awesome. The best quote from obi wan was: " I will take the boy, and watch over him". This line serves as the linkage between the 30 year space between the 2 films. Did you ever actually appreciate or even realize that obi wan was on tattoine for the sole purpose of being luke's guardian angel? And as discussed above , he literally does become his guardian angel after Vader kills him. Epic quote. The Cast that was assembled for the first three movies, IV,V & VI. That was an alignment of the stars never equaled. Plus the actors had to tell the story and not the special effects. The second series, I, II & III relied far too much on "OOOOH, look what we can do with the computer" to prop up weak story lines and really weak acting. Plus the cartoon charactures didn't add much to the validity of the series. It will be interesting to see this new episode, VII, when it's all said and done but I'm not going to hold my breath for any greatness. Comon guys, "the sand people frighten easily, but they will return, and in greater numbers". The best quote by far. It applies to Donald Trump and his followers. SWIV - New Hope - " In my experience, there's no such thing as luck ! "